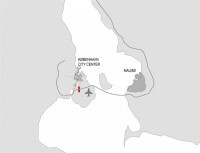 Situation of Orestad - Between Kopenhavn Citycenter, Malmo and the airport Orestad is well located with its direct access to highway and railway. It is easy to imagine the development of the new structure along Orestads Boulevard, giving a new impulse in urban planning between airport and Kalveboderne. Short ways to different infrastructures allow to reach cultural events, ARKEN museum of modern Arts, DR Byen Concert hall and recreational areas immediately. District - Orestad is a modern image of old Kobenhavn with its dense blockstructures, towers, green and particularly water-areas. The towers offer identity to outwards, and orientation inwards. 3 different landscapes and a free arrangement of inner squares form and divide the open spaces. It ends with a huge waterbasin in the south. The concept of Orestad is based on a hard border between the buildings and the open space. PLOT 16 - The Project is located in the very center of Orestad-South between 2 different landscapestrips, the central square and the main access of the district. 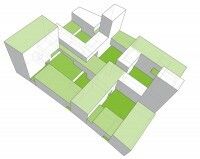 PLOT 16 is regarded as one component of the whole. It declines the rules of its neighborhood being a superblock on the large scale, but integrating also the human scale on the other hand. It is very present and offers orientation by its 3 landmarks marking the districts access, the central square and at the PARK ZONE. 5 inner courts structure the block providing different zones (public - private, urban courts - roofgardens) with varying directions, large enough to get sufficient light and air, small enough not to get lost. Balance between the 2 scales is the challenge of PLOT 16. Layering of programm - Inside the superblock the programm is superimposed vertically. On the Groundfloor, there is the public zone with different scale of shops, workshops, cafés and restaurants. The 1st and 2nd floor is dedicated for offices, studios and ateliers for small and large companies, but also for housing in loft style. On top of it, there is the private housing zone. Linked on a semi-private roofgarden there are different conditions of housing in maisonettes and flats provided.